Civic hackers in Honolulu will have a chance to talk with and learn from a fellow open government advocate in California. Steve “Spike” Spiker, founder and executive director of Open Oakland, will share his story with Code for Hawaii on Wednesday and talk about his organization’s work as an official “Brigade” for Code for America. Code for Hawaii is a group of volunteers interested in applying innovative thinking and technology to make local communities better. In addition to his advocacy work, Spiker is the Director of Research and Technology at the Urban Strategies Council, with a background in mapping and GIS systems. He also does side gigs as diverse as landscape and wedding photography and freelance web and IT work. In 2013, he was named one of seven “White House Champions of Change” in the field of civic hacking and open government. This week’s special guest was brought to the Honolulu brigade through its newest community organizer, Billy Meinke, who came to Hawaii from the Creative Commons organization and is now an educational technologist at UH. He’s the latest addition to a core team that includes yours truly, and is immediately endearing himself to the group by picking up pizza at J.J. Dolans on his way to the gathering. 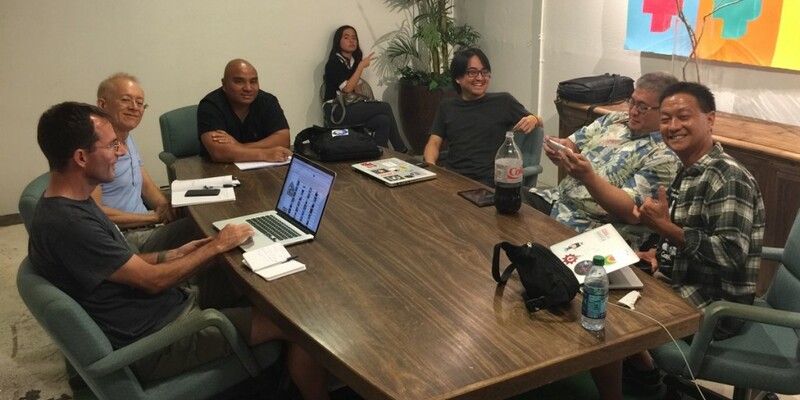 The Honolulu brigade has been meeting regularly (both in person and online) since rebooting earlier this year, and is about to launch regular “hack nights.” The hack nights will begin the first week in September, held on the first two Wednesdays of every month. And yes, this August meetup for Code for Hawaii conflicts with the HTDC’s Wetware Wednesday (which will focus on light manufacturing). In order to avoid breaking local coders’ hearts, forcing them to choose between two great events, Code for Hawaii will move its monthly meetups to the third Wednesday of every month going forward.